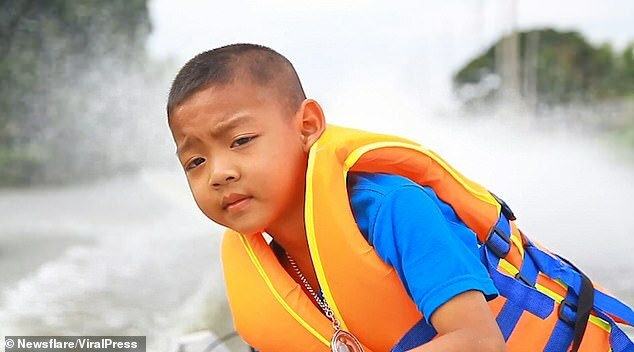 This young boy doesn’t need to worry about getting stuck in traffic on the school run because he pilots himself to classes on a motor boat. Five-year-old Tanadet Petnoi lives a wooden house that backs onto a canal in Samut Prakan, on the outskirts of Bangkok. 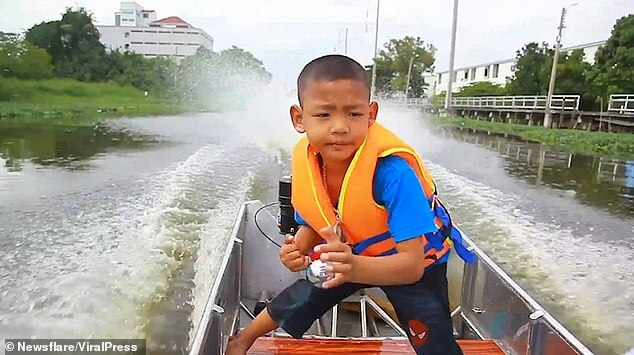 He started riding in his father’s boat before he could walk – and is now skilled enough to take control of the rudder and steer the longboat at speeds of up to 40mph. Bangkok’s waterways were once the main form of transport in the 19th century – giving the city the nickname the ‘Venice of the East’ – and Tanadet is keeping that tradition alive. 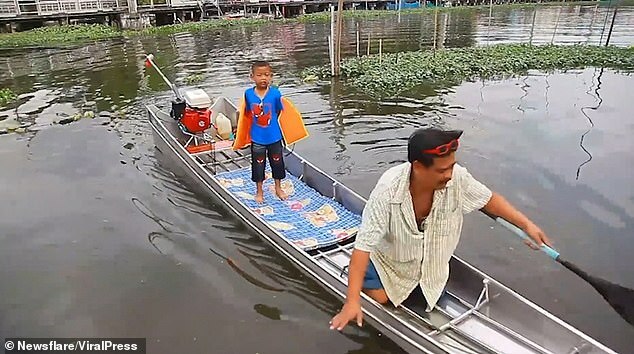 Footage shows how the pint-sized helmsman navigates the canals on his daily commutes with father Banpot, 25, as a passenger. Tanadet’s father also helps him to start the engine, because Tanadet is not yet strong enough. Tanadet said: ‘I used to play games on a tablet. But after learning to steer the boat, now I do not want to play computer games, I want to be on the water. ‘It is very good exercise and good for people to learn to do this. My father is very careful and I have to learn more about safety. Tanadet’s father, Banpot, a car mechanic, said that he taught his son how to pilot the boat because their house is next to the canal. He added: ‘Tanadet can go everywhere by himself. He is very skilled and can handle the boat by himself.